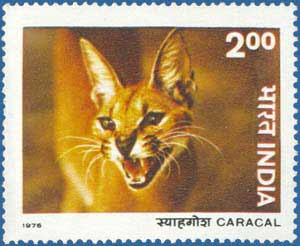 Caracals are known and called by many names: The Indian Lynx, Divyabhanu Singhji says in his book ‘The end of a trail’ that the animal has no hindi or urdu name but it is known as ‘Siagos’ which is in persian, however Balendu Singhji a known wildlifer and lodge owner says it has a popular name in Rajasthani ‘Mor mar Bhageri’. 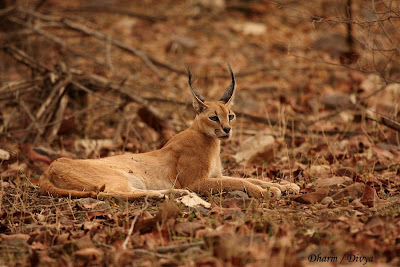 The kutchi dialect of gujarati has a name for it ‘Harnotro’ meaning haran (Chinkara) like colour. 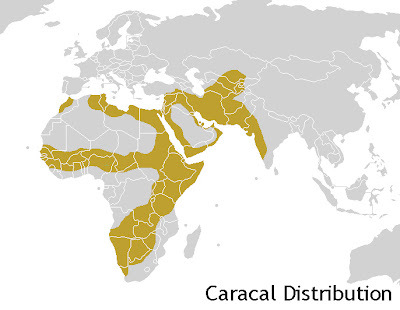 Distribution: Caracals are native to Africa, Asia, and even certain areas of the Middle East. This is by unknown painter of Moghul period, 17th century. 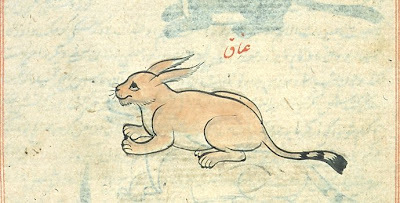 As seen the artist has inaccurately drawn the tail long, because the animal was equally elusive and mysterious in those days. 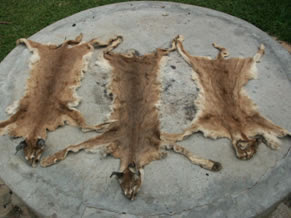 The tail has black marking while in reality caracal tail doesn’t have such markings. 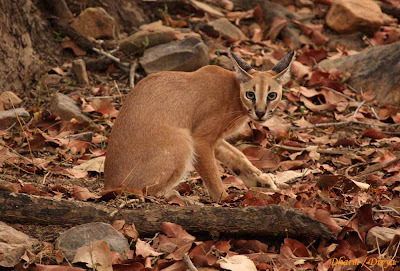 Body shape and size: The caracal is a medium sized cat. 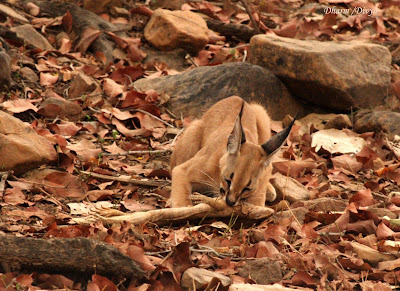 The Caracal's hind legs are longer than its front, which helps it in leaping in the air. The front legs and shoulders are heavily muscled, to help it clamp on to its prey. Its hind paws are smaller than its front paws, but are still large enough. All the paws are wide, and well padded, to help its movement remain quiet in grass, or to walk in a deep silence. Each paw also ends in four retractable claws, which are four to five nailsbreadth in length. They are capable of tremendous aerial acrobatic jumps and can land safely.. .Caracals have the claim to fame of being the "fastest of all the small cats". 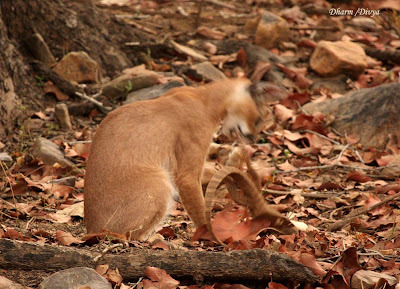 The caracal has also been known to leap up into the air to successfully catch flying birds as prey. Two of his works spoiled the Kachida valley habitat. 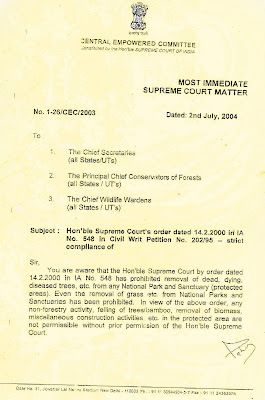 A) The first one is negligence in the day to day patrolling due to which Kachida area’s half valley is destroyed because of illegal wood cutting. 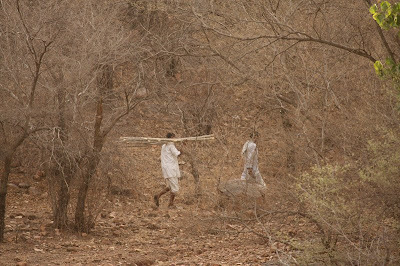 Hundreds of villagers from Badhlav, Rawal and Ulliana villages come inside the park and cut Dhonk trees. Tourists see this, guides and drivers see this but not the ranger of that area. B) The second is equally disturbing, in this year close to kachida in the 3 kilometre area of Kachida valley, 10 anicuts and 6 big talai’s (ponds) are being created. There is sand below it and not clay hence this place is not appropriate. Yes, water will hold there just during the monsoons, but later water will not hold in such a place. Not just this, for making these anicuts he blasted the areas with heavy commercial machinery creating disturbance in the park! 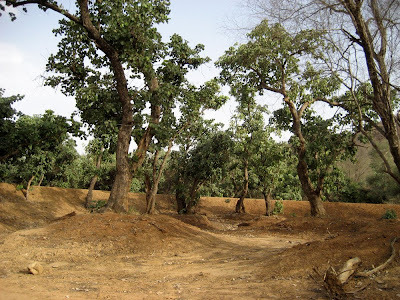 1) A lot of trees were cut in order to make the talai’s deeper. 2) There is no catchment area so where will the water come from in these talai’s. The area is dug out but there is no place where water can hold for a long time, they have just made a depression, a pond like structure but no catchment area! 3) The side walls of the dam are higher than required, clearly showing illogical planning and wastage of money. 4) There are cracks in the newly constructed talai’s already. 5) For making all these talai’s and water bodies, machinery like JCB (Heavy Excavating machine) were used for months inside the park creating atrocious noise disturbance for park animals. 6) For any kind of construction, road making in the park, etc the planning has to be put up in the ‘park management plan’ prior, and if not mentioned it has to be approved by the Central Empowered Committee (CEC). This was not mentioned in the management plan and no permissions were taken for this construction. 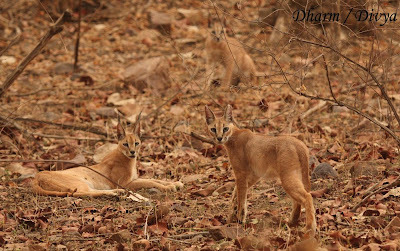 Ranthambhore habitat is dry with less rainfall; such is the areas where the caracal lives. However since a few years there are so many water holes being created in the place that due to this the soil below gets wet. 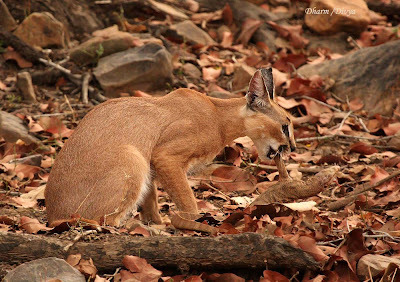 Now if you understand caracal’s food habits, it is mainly dependent upon rodents and other burrow inhabiting animals. 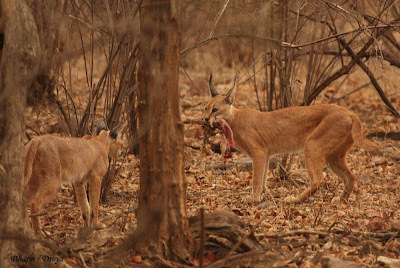 These animals move away from the areas and so the prey base for the caracal becomes less. 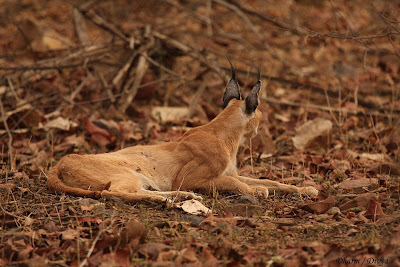 I stopped jogi and said, arrey now again your activism has come in and the amazing caracal sighting experience has taken back seat! What’s this Jogiji? World over, Ranthambhore National Park is famous for its wild tiger’s. 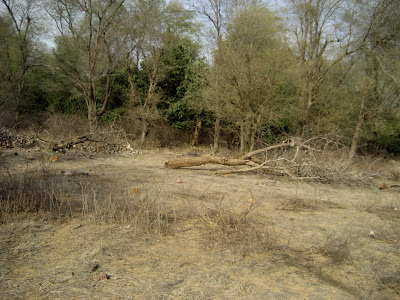 This is a dry deciduous fragile eco-system where in the shade of tigers a lot of other animals survive. 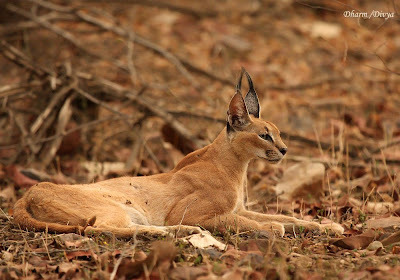 There are some animals like Indian Caracal, whose charisma is equivalent to that of a wild tiger; but the threat upon them is a lot more than that on the tiger. 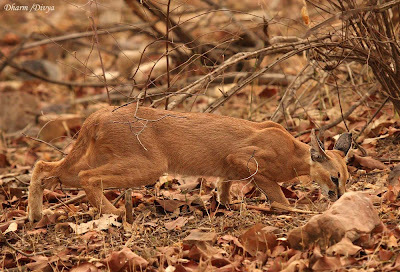 Today there are 37 tiger reserves in India but there are just 3 prime habitats for Caracal, Kutch (Gujarat), Sariska Tiger Reserve and Ranthambhore National Park. 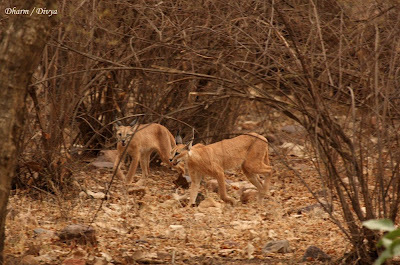 In Ranthambhore, the way in which alterations are being made in the habitat since past two years, it has created a threat to the Caracal species. This alteration is a lot of construction in the park, waterholes, trees cutting for the same, construction of roads...which are not required by the animals residing in the park! This is required by the corrupt officers who minting money with such works. 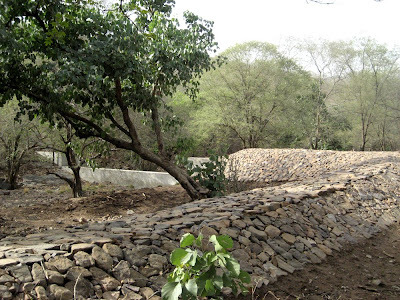 In the name of making ‘suitable habitat’ for wild animals massive unwanted construction work has been done in the park. We appeal to you, Dear Minister, please stop this and replace the insincere, corrupt rangers posted since 15 years in same range, with some good officer. I have been following your blog of late and I think it is excellent. Do keep blogging. If you are interested in a photography site which actively supports and allows conservation topics, do email me through my blog. 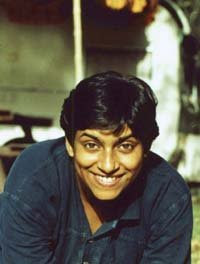 kudos to Tiger watch team fr the arrest of Gopal ! then why can't concerted effort be created to oust that corrupted RFO? i saw myself in Kachida lots of constructional activities goin on detrimental fr wildlife! 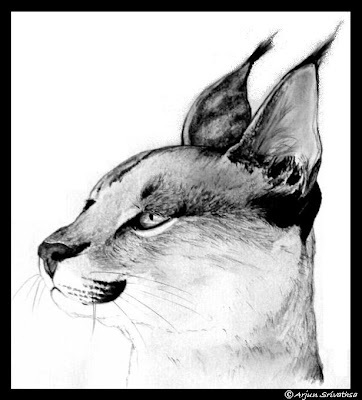 Thanks for the information on the Caracal. 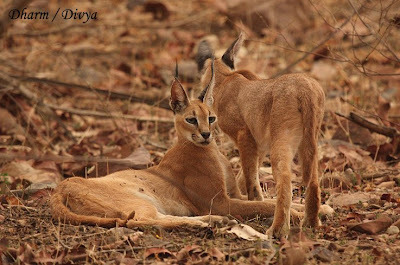 I have just started wildlife photography seriously, and was planning to visit Gujarat where Caracal (Kutch DIstrict) was an animal i wanted to photograph. 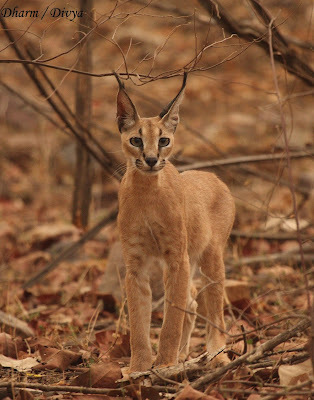 Caracals are easily domisticated and breed captivitally in many parts of the world, i know of one breeder in Dubai who has atleast 100 Caracls and Servals of his own all healthy and domisticated. 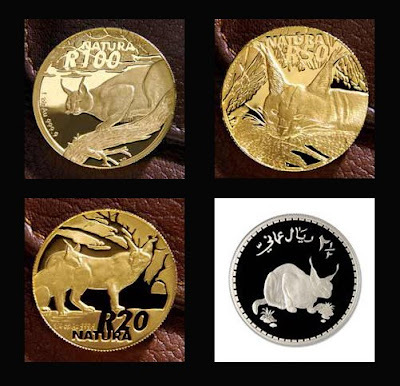 I would say if you want these animals to grow in population our Government should allow captivity breeding programs where death is minimised and growth is atleast 80percent. Same with Tigers you will see more quality and quantity in Thailand breeding programs where they are allowed to breed in captivity by private breeders. Our government can monitor on those breeding programs instead of waisting salary on zoo keepers who do nothing but make sure our lovely animals look so poor in health n die. Its just my personal experiance seen alover when travelling..
hmm thanks for the info.. never knew such a beautiful animal existed in India..so seldomly researched..way to go..keep up the good work..